Forty-seven pterosaur skeletons unearthed at Brazilian site, study says. Nearly 50 skeletons of a new species of ancient flying reptile have been unearthed in southern Brazil, an “absolutely unprecedented” discovery, one expert says. Varying ages of the newfound species, dubbedCaiuajara dobruskii, fill the rare boneyard, which was once part of a desert lake in the late Cretaceous period, about 100 million to 66 million years ago. With a wingspan of up to 7.7 feet (2.35 meters) C. dobruskii had a head that was shaped differently from those of other pterosaurs, including a bony protrusion in front of its eyes. The discovery offers the “best evidence ever uncovered” that the extinct dinosaur-era animals, called pterosaurs, may have lived in colonies, said study author Alexander Kellner, a paleontologist at the Federal University of Rio de Janeiro in Brazil. It also offers a new window into how the animals—the first vertebrates to fly—developed into adults. Finding such an intact fossil site is unusual—though pterosaurs were found on every continent, their fragile wing bones do not preserve well. What’s more, most pterosaur remains have been found near what was once oceans or lagoons, not desert. “To be honest with you, when they first told me they had pterosaur bones, I was going, ‘Yeah, sure,'” Kellner said. But once he confirmed the bones, he was thrilled. “To find part of what could be part of a [pterosaur] population is really splendid,” he said. Caiuajara dobruskii gets the second half of its name from Alexandre Dobruski and João Dobruski, the local father and son who first noticed odd bones poking out of the ground near Cruzeiro do Oeste (map) in 1971. But it wasn’t until a few years ago that paleontologists began excavating the site and found the incredible jumble of skeletons. It’s unknown why or how the 47 pterosaurs died, but it’s possible a desert storm or a drought caused their untimely ends, Kellner said. To Mark Witton, author of the 2013 book Pterosaurs, the “gem” of the new research is finding so many pterosaurs in one place from the same species. For instance, the number of animals found together suggests that C. dobruskii lived in groups, like flamingos, which may have flocked to the inland lake as an oasis in the otherwise dry landscape, said Witton, who was not involved in the research. What’s more, the new research, published August 13 in the journal PLOS ONE, allows scientists to chart the development of a pterosaur from youth to adulthood, providing “a really detailed, step-by-step representation of actual fossils and how it changes,” Witton said. Historically, scientists have only been able to piece together how pterosaurs developed and lived based on skeleton fragments. 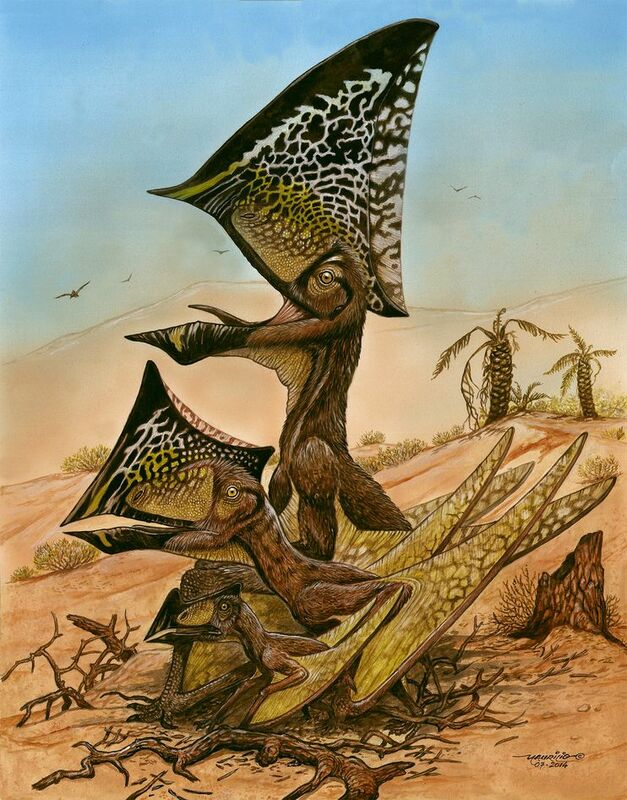 Already, the new study hints that young pterosaurs were not highly dependent on their parents. That’s because juvenile pterosaurs found in the boneyard seemed to be miniature versions of adults—for instance, the young sported the adult signature crests on their heads. Being so well developed, this means the young could also probably fly from birth, noted James Clark, a biologist at George Washington University’s Columbian College of Arts and Sciences in Washington, D.C., who was also not involved in the new study. It’s “really rare to get that kind of assemblage and growth series—you don’t see that in that same extent in other collections” of pterosaur fossils, Clark said. Such independence is typical of some modern reptiles, such as crocodiles, which are born looking like tiny grown-ups, Witton added. “This is really going to give us so much information about how these animals grow, what their population structures were like—so much data for us to look at,” Witton said.